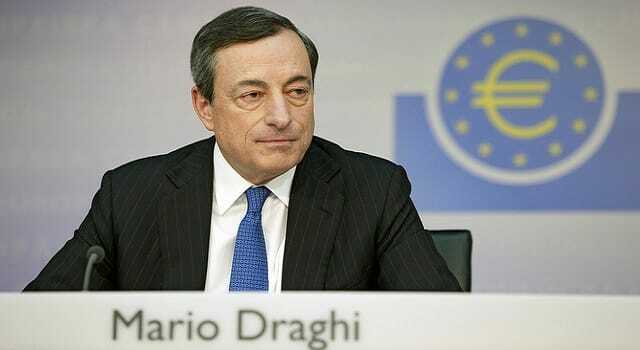 This past Thursday, Mario Draghi, president of the European Central Bank (ECB), announced that the ECB will launch its own Quantitative Easing program in March, purchasing €60 billion ($67 billion) in government debt each month. Currently the plan is to run the program until “at least” September 2016. Over the course of this time, that would represent a massive €1.14 trillion ($1.28 trillion) in new money dumped into the market. By taking this path, the ECB will be following the lead of the U.S. Federal Reserve, the Bank of England and the Bank of Japan, all of whom have been buying record amounts of government bonds in recent years to try to keep their markets from deflating. Draghi and his fellow central planners believe the increased liquidity will find its way into the markets and improve the real economy through a trickle down wealth effect. However, criticism of Quantitative Easing will point out that this false money creation ends up forming asset bubbles and devalues currency, thus punishing the average saver. The ECB, like other many other western central banks, thinks it can fix a debt problem by creating more debt. It is akin to the absurd notion of trying to douse a fire by pouring more gas on it. Here in the U.S., we’ve already been through three rounds of Quantitative Easing – with many calling for a fourth round to begin in the next year. So what’s to think that the ECB will definitely cease their own program by September 2016, as is currently the goal? What then? More QE? Central banks only have two tools in the shed to fend off deflation: (1) Lowering interest rates and (2) printing money via Quantitative Easing. With interest rates being at next to zero percent, the only option left is to print more money… and they must print more money in larger amounts to cover the interest on previous debt. So yes: It’s quite likely that this first “round” of QE in Europe is only the tip of the iceberg for money printing there. This kicking of the can down the road has gone on for some time now – far too long, we would argue. The question on everyone’s minds now is how much road is left before it ends… or the can is completely destroyed. Some nations aren’t waiting to find out. Last week, the Swiss National Bank ditched the euro peg in anticipation of Thursday’s news, sending the Swiss franc soaring rather than having their currency dragged into a currency war. In today’s globally integrated economy, every central bank action has a ripple effect, and the announcement by the ECB of its QE program is going to send shivers down the spine of the EU member nations and their people, as their cost of living is set to soar in an already downturned market. With time, the repercussions will be felt here as well. As the dollar strengthens against the devaluing euro, expect the Federal Reserve to respond with even more currency devaluation of its own. Renowned economist Jim Rickards recently told Bloomberg that he believes the Fed will implement QE4 by early 2016. Whether that date is exactly correct or not, one thing is for certain: We are in the embryonic stages of a major global currency war, with many more countries likely to join in. As our central bankers do everything they can to devalue our currency, there’s a very simple way to protect your savings: Own physical assets, like gold and silver. In Europe, and even in Canada, gold has “gone parabolic” in recent months. When the dollar faces a similar crisis, will you be prepared? Don’t wait any longer. Click here to get your very own information kit today. Birch Gold Group is proud to have achieved a fantastic track record with its thousands of satisfied clients over the years. See our AAA rating with the Business Consumer Alliance.